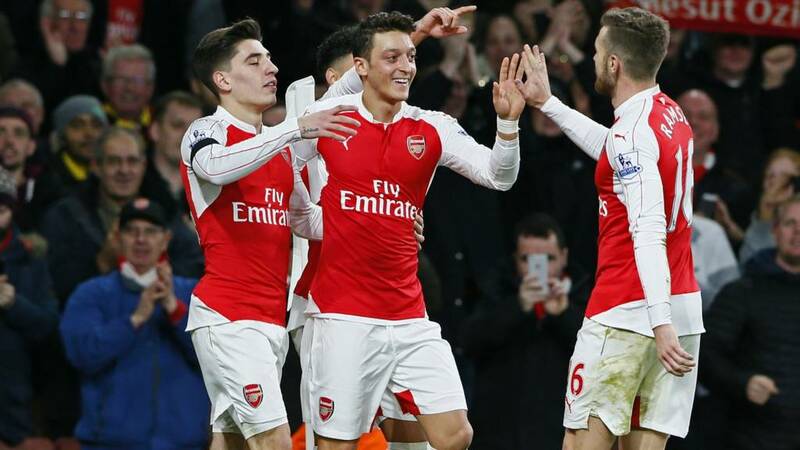 If you want to read more on Arsenal's win, follow this link. And you can follow all the reaction from Monday's Premier League games here. That's it. Arsenal go top of the Premier League, for 24 hours at least. Bournemouth have kept on going and Glenn Murray puts a dangerous strike across goal, which Petr Cech finger-tips wide. But straight on the counter attack go Arsenal. Mesut Ozil once again supplies Theo Walcott but the England man can only force a save from Artur Boruc. Another mazy run from Alex Oxlade-Chamberlain sees him make it into the box, but he's hustled out by the Bournemouth defence. Mesut Ozil then swings in a sumptuous pass for Theo Walcott, but the Arsenal forward can't convert. Alex Oxlade-Chamberlain is inches away from Arsenal's third. He cuts inside and his shot is just deflected wide of the post. At the other end, Junior Stanislas controls the ball and attempts to unnerve goalkeeper Petr Cech with a cross-shot, but it's wide. Eunan O'Kane has a go from inside the box for Bournemouth but it goes pretty high over the target. Another change for Arsenal as Nacho Monreal comes on for Kieran Gibbs. Bournemouth forward Joshua King doesn't look too peachy. He's pulled up with a hamstring injury and is replaced by Glenn Murray. Meanwhile, Olivier Giroud slices wide of the target and is then replaced himself by Joel Campbell. If Bournemouth fail to score, there's a Premier League record heading Petr Cech's way. The Arsenal goalkeeper will have kept his 170th top-flight clean sheet. Quite remarkable. Still 15 minutes to go, mind. Bournemouth are still having a go here. Winger Matt Ritchie lets fly from 30 yards but his shot is caught by goalkeeper Petr Cech. Close again for the hosts. Olivier Giroud's shot is saved by Artur Boruc and parries the ball into the path of Theo Walcott, but he misses and he's then ruled offside anyway. Two Arsenal chances go a begging in quick succession. First Olivier Giroud is unable to control Aaron Ramsey's pull-back and although Bournemouth clear the danger, Mesut Ozil finds himself in space again. The German can't find anyone to feed to, though. "The first 'we are top of the league' chant rings out around Emirates Stadium, and the pressure is back on Leicester tomorrow night as the Gunners look set to reclaim top spot tonight. Bournemouth will hustle and bustle, but realistically it looks like damage limitation for the Cherries from now." Hector Bellerin feeds Theo Walcott and the England man hits it low but puts it just past the post. Some slick, slick action on show from Arsenal for their second. Mesut Ozil passes to Olivier Giroud, and the Frenchman, with his back to goal, provides a cute flick for Ozil to casually slot home. Dan Gosling is looking fairly lively for the visitors. The midfielder meanders his way into the box and grapples with goal-scorer Gabriel, and the ball is cleared. But it's to be Gosling's last action of the match. He comes off and Eunan O'Kane takes his place. Meanwhile, Calum Chambers is booked for a challenge on Harry Arter . Arsenal have switched off a bit and Bournemouth earn a corner. Cherries substitute Junior Stanislas takes it short to Harry Arter, and the ball is flung in but Calum Chambers rises high to head away the danger. Petr Cech sees some action! The Arsenal goalkeeper collects Adam Smith's ball from the right with ease, after some nice overlap play from Smith and Matt Ritchie. Bournemouth play a diagonal ball across to lone striker Joshua King, who looks offside and even has a look himself. He pulls the ball back to Junior Stanislas but the danger is expertly cleared by Gabriel. Theo Walcott immediately goes on the break and Bournemouth manage to halt the pressure, but only after Alex Oxlade-Chamberlain's deflected shot is collected by goalkeeper Artur Boruc. Bournemouth start us off again, kicking left to right. The players filter back out onto the immaculate Emirates pitch. Bournemouth make one change as Junior Stanislas comes on for Marc Pugh on the left-hand side. A straight swap from Eddie Howe. It's pretty clear to see who Arsenal's danger man is. Mesut Ozil has taken 55 touches in the first half, completed eight crosses, and made six key passes in attack - all of which are game-high tallies. And he's now up to 16 assists for the season, too. The stats at half-time show Arsenal's dominance, despite a really decent opening 15 minutes from Bournemouth. Arsenal end the half in the ascendancy but can't find a second goal...yet. Referee Roger East waves away Arsenal calls for a penalty, as Olivier Giroud feels he was impeded by Simon Francis but it was the Gunners man who backed up into Francis. The half-time whistle goes and Bournemouth have got a tough job on their hands. Bournemouth are having to defend very,very deep while Arsenal casually pass the ball around with ease. Hector Bellerin launches three separate crosses in from the right, and although none of them are met by a waiting Arsenal forward, it's keeping the Cherries defence on their toes. Then, from a Mesut Ozil corner, Aaron Ramsey comes storming in but his header goes away from the goal. Alex Oxlade-Chamberlain makes headway on the right flank, and a beautiful Mesut Ozil ball to Theo Walcott isn't converted. And then, somehow, Per Mertesacker manages to head against the side of the post from about two yards out. To be fair to the German, he didn't know much about it. Gabriel's shot had come off the post and it was palmed in his direction by Bournemouth goalkeeper Artur Boruc. "This time there was no mistake from Arsenal's set-piece technique as Gabriel escaped his marker to meet Ozil's sweetly struck corner with a firm header across Boruc's goal. Suddenly the tension of the preceding few minutes disappears - and the Gunners are back on track to top the league, at least for the next 24 hours." A lovely run from Alex Oxlade-Chamberlain forces a corner. It's whipped in by Mesut Ozil and headed in beautifully by defender Gabriel for his first Arsenal goal. Harsh on Bournemouth, but well executed by the hosts. Ooooh, we've got some groans from the Arsenal fans. "Come on! ", you can hear them shout. And their calls work. Arsenal's first real chance comes as Mesut Ozil dinks a ball over the defence and finds Theo Walcott, but he fails to connect and it's collected by keeper Artur Boruc. I won't lie, this game isn't great so far. It's very pedestrian from both sides - no-one's really broken a sweat. Hector Bellerin fouls Bournemouth's Marc Pugh and gives away a free-kick but it comes to nothing. At the other end, Calum Chambers tries to swing a ball across the box from the right but it's wayward. "Bournemouth manager Eddie Howe singled out their defending of set-pieces for praise after Boxing Day's goalless draw with Crystal Palace, and his goalkeeper Artur Boruc will be happy if all Arsenal's corners are like their first, floated in and allowing him to catch the ball unchallenged. While the visitors have had to stand firm in defence so far, a wide, well-manicured pitch has allowed them some dangerous breaks upfield against the would-be league leaders." Bournemouth aren't scared to have a go. An accurate ball-in from Harry Arter finds striker Joshua King but he's smothered under a pile of Arsenal defenders. Arsenal midfielder Alex Oxlade-Chamberlain goes on the attack before being clipped on the ankle and brought down. Arsenal haven't got to grips with the game just yet, but are able to produce a nifty little counter-attack. Aaron Ramsey snatches a loose ball in midfield and it's fed out wide on the left but Olivier Giroud can't find Mesut Ozil and it's cleared. Joshua King, on his return to the Bournemouth squad from injury, has a go at goal with a gentle, curling effort. It's easily collected by goalkeeper Petr Cech. There's bit of a worry for the Cherries as midfielder Harry Arter goes down after a clash of heads with Calum Chambers. He gets up gingerly, and will carry on for now. Bournemouth earn the first corner of the game and it's taken short and not too successfully. Arsenal forward Theo Walcott steals possession and paces forward but it comes to nothing. Cherries boss Eddie Howe has his notebook out already. Bit early for that. The players enter the field and help the fans in giving the late Don Howe a rousing minute's applause. The former Gunners manager passed away, aged 80, last week. Arsenal then get us under way at the Emirates. "'London Calling' by The Clash booms out around Emirates Stadium as kick-off approaches and the last few home fans file in for this sold-out game. Bournemouth sold out their allocation of 3,000 tickets in rapid order and are jam-packed into their corner, in good voice. Minnows they may be in top-flight terms, but they will look back on 2015 as arguably the greatest single year in the club's history." BBC Radio Solent's Chris Wise gives us a glimpse of the Arsenal programme which is dedicated to Don Howe, who passed away last week. There is no need to scream your prediction at your computer any more - you can have your say using BBC Sport's Predictor. Eddie Howe's Bournemouth are only three points off the drop zone in but they're on a decent run going into their final game of the year. The Cherries are unbeaten in six Premier League matches (W3, D3) and have a decent record in the capital. Arsenal always let you down and it happened again at Southampton. They just didn't appear. Arsenal were bullied by Southampton, they had no answer to Shane Long's pace and capitulated towards the end. It looked a game too far for some of the players, which is worrying, but even on a bad day they will create chances. With the players they have got Arsenal should be favourites to win the league from here but the problem is they always throw in a Southampton type result. In a normal season you would worry for their chances but in this season of flux, of change, of inconsistency they will probably get away with it. I love the spirit of Bournemouth and the way that they don't change the way they play for anybody. They run their hearts out every game. They won't get a result at the Emirates though. With current leaders Leicester not playing Manchester City until Tuesday, second-place Arsenal have the chance to go top of the Premier League. But they're going to have to shake off the Boxing Day hangover, after their 4-0 defeat by Southampton which ended their four game unbeaten run. If the Gunners do finish the year on top, it will be for the fifth time, after 2001-02, 2002-03, 2007-08 and 2013-14. And only in 2001-02 did they go on to win the league. "Arsenal and Bournemouth have never met in the league, and their paths have only crossed once in competitive football - in a League Cup third round tie at Highbury on 27 October 1987.Harry Redknapp's Cherries, newly promoted to the old Second Division, had knocked Southampton out in round two but Michael Thomas, Alan Smith and Kevin Richardson helped the Gunners to a comfortable 3-0 win. Picking the ball out of the net three times was Bournemouth keeper Gerry Peyton - who is now Arsenal's goalkeeping coach." That, my friends, is knowledge. Bournemouth make two changes, with Marc Pugh replacing top scorer Junior Stanislas on the left and fit-again Joshua King coming in for Glenn Murray as the lone striker. Arsenal make four changes after their shock 4-0 defeat by Southampton on Boxing Day. Kieran Gibbs, Calum Chambers, Gabriel and Alex Oxlade-Chamberlain replace Laurent Koscielny, Nacho Monreal and Joel Campbell and Mathieu Flamini. But who is going to go see out the year with a bang - FA Cup winners Arsenal, or Championship title holders Bournemouth? Welcome to our live page for Arsenal v Bournemouth. We’ll have live text commentary here from 17:00 GMT. You can keep up to date with all the build-up and latest from today’s other games here.